I registered for this race just a couple of days ago. I figured it would be a good way to be sure to get in a quality long run. I have not been running many long runs of late. I had an achy knee last Feb/March and limped into and through the LA marathon. After that I took some time off and sort of started over. The longest training runs have been the 12.5 mile trail run from San Francisquito to the bus bench. That and the Holly Jolly Half back in December….. At the Holly Jolly I wanted to be under 1:40, but the wind and lack of training did me in. So yesterday, at 7 p.m. I was in the crowd with all 4 Rubles and and all 4 Gutierrezes. Cade wanted to PR. Erik was going to run with Montserrat and help her to her first half marathon. Krysti was going to stay with Brock for his first half. Dora, Oscar and Natalie were out there to race. My goal was to be under 1:40. The obstacle this time was going to be the hills. As the race started I noted the 1:40 pace group was a little out ahead of me. I felt like I was moving very comfortably. Within a half mile or so I spotted Oscar and Natalie go by. I stayed pretty close behind them. I wanted to at least hang with the 1:40 group so I sped up a bit and caught them. Then the course narrowed. We were getting crowded. I saw an opening and surged out ahead of the 1:40 pace leader and also surged ahead of Oscar and Natalie. I could hear the pace leader giving instructions from time to time, but I felt like I was pulling away from him. Then the hills came. 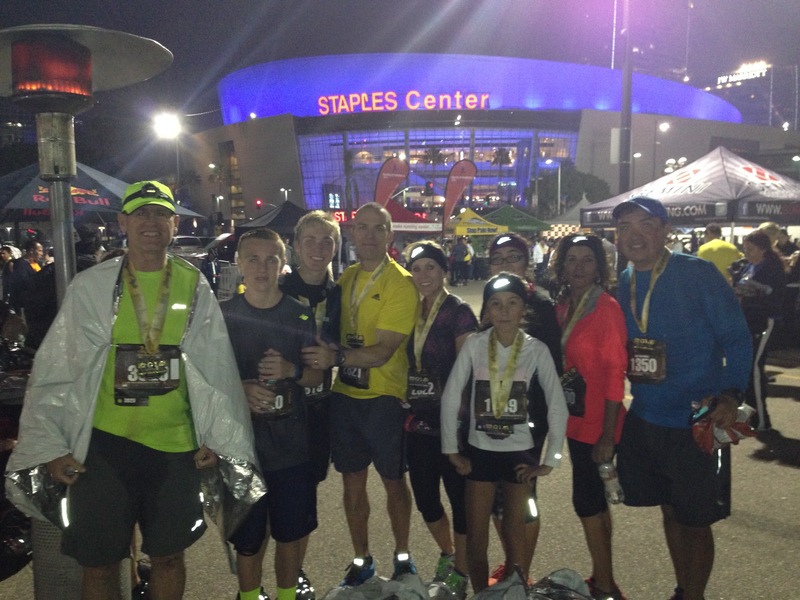 This course started in downtown Los Angeles and headed north over the 101, then northwest up to Dodger stadium. In the dark I could not quite figure out where I was but the course maneuvered all around the stadium, into the parking lot and back out, into the stadium itself for a lap, up and down and up and down. It was crazy hilly. There was one particularly long and steep hill going into the stadium for the first time. It was .9 miles long and climbed 150 feet. The 1:40 pace group ran by, then the 1:45 pace leader went by. Then Oscar caught me. I noticed that Oscar was using a really quick cadence. I picked up my cadence and stayed with him and pulled back ahead. At the top of the hill as it leveled off, i caught the 1:45 guy and told him that either he or the 1:40 guy were off pace. We were 1/4 way through the race and they were about 150 meters apart from each other. I got ahead of him and kept my focus on the 1:40 guy. Every time there was a downhill I really let it fly. I would gain on him. On the uphills I concentrated on using that low gear, really quick turn over. At mile 8 as were finally leaving the stadium for the last time, I could still see him a couple of hundred meters ahead. I kept gaining, and gaining, and gaining. Around mile 10 we made a sharp right turn. I took the inside track and passed the group! I was feeling tired but i was still able to maintain my rhythm and my stride. A little while later I spotted Cade. I went by. He spotted me and told me that he was not feeling well. The last three miles were back in downtown and they were finally flat. I continued passing people all the way to the finish. As we went around the last turn with about 200m to go I was actually able to put in a kick! All the while, however, I had no idea how I was doing. It was dark and with limited light I cannot read the numbers on my watch! I could make out the Timex from time to time once I was back in downtown. I knew I was sub 1:40. My official finish time was 1:38:48. I was 98th place of out 3732 runners. In the 50-59 age group I was 5th place! I was less than a minute from 2nd place, only 13 seconds from 3rd. I was a very happy, very tired runner! Cade came in, after a pit stop, at 1:49. Oscar hung back with Natalie and the two of them finished in 1:51 – Natalie was 2nd place in the youth age group. Dora was next at 1:53, her new PR. Krysti and Brock finished in 2:00. Erik and Montserrat finished in 2:04. Former Hillview runner, current Quartz Hill runner, Travis Cetti ran the half marathon in 1:22:40. He was the 6th place finisher and the first in his age group. Way to go Travis! According to my Garmin -after some correction by Trainingpeaks. This course had 1339 feet of elevation gain with 1421 feet of loss. This running calculator converts my 1:38:48 to a 1:34:40 on a level course – nice! An analysis of mile splits would be pointless on this hilly course, but Strava broke the race into quarters: 24:17: 25:59 (lots of uphills), 24:34 and 23:58. On strava there are a few segments set up. That big hill is one. I rank 19th. The final stretch of .6 miles is also set up as a segment. I rank 9th! Great job! A sub 1:39 on that course is fantastic! All your strength workouts with Clay and the trail running paid big dividends in the race. Not to bad for all the rest and lack of miles. Imagine if you trained for one.